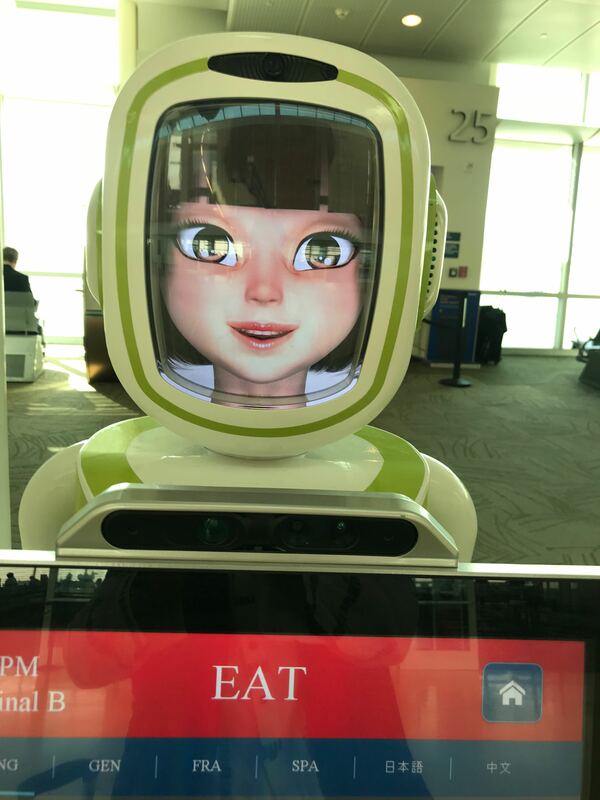 Six months ago, I was all in favour of the arrival of interactiv e androgynous robots in public places, like shopping malls and airports, that had the potential to be equally appealing and entertaining to kids of all ages and gender. Now I am not so sure. When departing from San Jose airport the other day, I came across a new breed of plastic robots that provide public services for travellers and their young children. 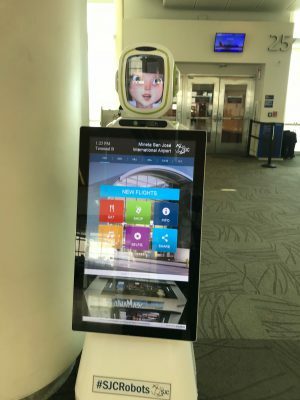 The first one I encountered was a weird looking robot-guide, about adult-sized, who looked less robot-like and more digital display-like with a ‘blockhead’ stuck on top. I approached it out of curiosity, then started pressing icons on the display to get directions to a coffee shop. While interacting with it, its encased head appeared to move while its eyes blinked at me. Not creepy but over the top silliness: a strange way to mix technology. Three of these so called greeters, named Norma, Piper and Amelia, have been at San Jose for over six months! They were developed by a Korean company and cost $120,000 each. That might explain their design but this is Silicon Valley. Then a hundred meters away, I noticed a play area where two more plastic robots stood motionless amongst a bunch of other more colorful, conventional toys, such as a truck, balls, soft dolls, a desk and chair, crayons and the like. 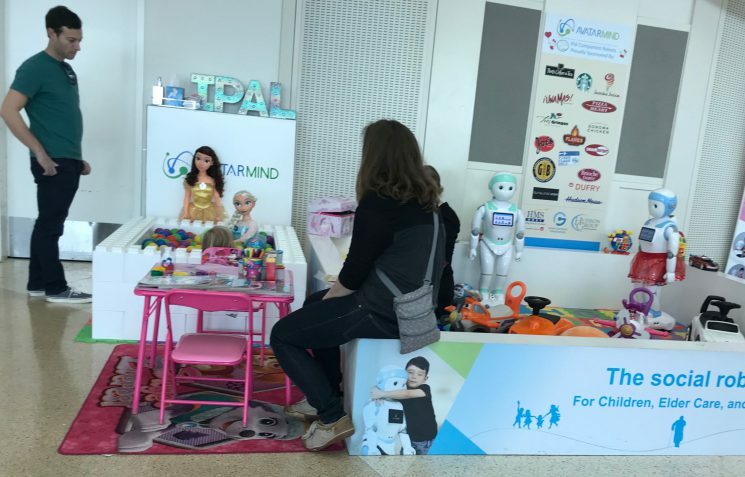 When a mother stopped to look, the human assistant in the play area invited her to place her toddler into the play pen. She then switched on the robots to make them come alive with the goal of attracting the child towards them. Their tummy displays lit up and they made some sounds. One started moving its clunky arms towards the toddler, as if beckoning it to come closer. The child glanced momentarily at it but then turned to play with the truck on the ground that it was near to. They seemed far too big and ungamely for toddler interest. Compared with the toys that come alive in the Toy Story movie, the robots did not become animated when switched on but stood strangely, inanimate and cold-looking. And their white plastic bodies looked most unappealing. Neither robot had mouths but just big inset eyes. One of the robots had been dressed in a little frilly, red tutu-thingy. It looked most bizarre. The mix of cloth, plastic and digital display materials did not work at all together in this context. And why leave the other one ‘naked’? Most people walked straight passed the play area without so much as a glance. But one couple that did stop (they seemed to know the human assistant already) placed their toddler in the smaller pen next to the robot area. The toddler started to play with some Disney-character, oversized, but more ‘normal’ looking dolls. During this interaction, none of the assembled humans took a blind bit of notice of the robots. 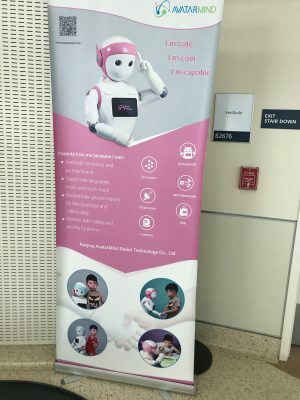 I walked closer to the play area to read the marketing banner that was promoting the new child-friendly robot. “I am cute, I am cool, I am capable” it proudly acclaimed. We have a long way to go before robots start to get anywhere near being any of these – let alone useful, attractive or desirable – at least in these settings.